System A (Aristocratic): The Passover meal is eaten after sundown at the beginning of Abib 14. Unleavened bread is eaten with the meal. Passover day, Abib 14, is a High Sabbath and the first day of the Festival of Unleavened Bread. The total number of days of the Festival of Passover and Unleavened Bread is 7 days, being Abib 14-20. The total number of days of eating unleavened bread is 7 days, being Abib 14-20. System B (Hasidic): The Passover meal is eaten after sundown at the beginning of Abib 15. Unleavened bread is eaten with the meal. Passover day, Abib 14, is a preparation day and not a High Sabbath. Abib 15 is a High Sabbath and is the first day of the 7-day Festival of Unleavened Bread. The total number of days of Passover and Unleavened Bread is 8 days, being Abib 14-21. 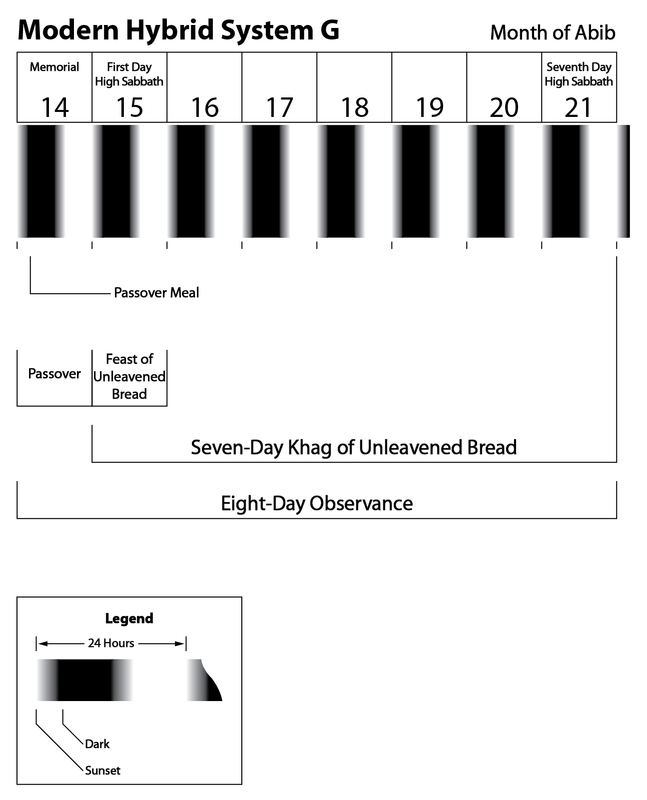 The total number of days of eating unleavened bread is 7 days, being Abib 15-21. System G (Modern Hybrid) The Passover meal is eaten after sundown at the beginning of Abib 14. Unleavened bread is eaten with the meal. Passover day, Abib 14, is a preparation day and not a High Sabbath. Abib 15 is a High Sabbath and is the first day of the 7-day Festival of Unleavened Bread. 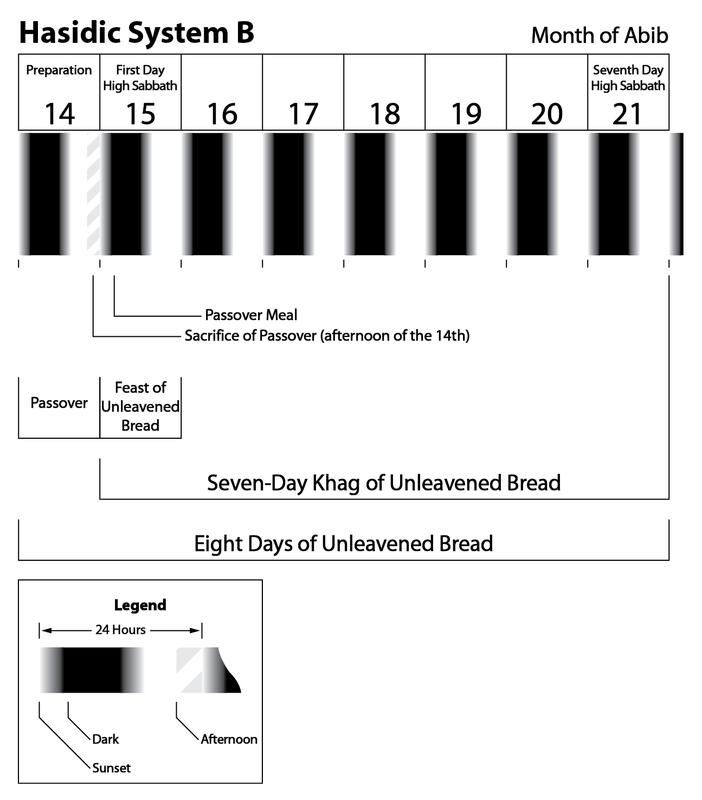 The total number of days of Passover and Unleavened Bread is 8 days, being Abib 14-21. The total number of days of eating unleavened bread is 8 days, being Abib 14-21. When all the facts are considered it becomes quite apparent that the barrier to Yahweh’s truth of the correct practice of the Festival of Passover and Unleavened Bread is the dispute over the timing of ערב (arab; evening) and the meaning of the phrase בין הערבים (byn ha-arabim; between the evenings)—found in Numbers 28:4, Exodus 12:6, and Leviticus 23:5—as the time when the Passover lamb was sacrificed. The first important key to solving the puzzle of the Festival of Passover and Unleavened Bread celebration is to discover upon which day the Passover meal is eaten, Abib 14 or 15. In turn, this discovery will lead to the second important key which will reveal on which day the Festival of Unleavened Bread begins, Abib 14 or 15. All agree that the Passover was sacrificed on the 14th, but disagreement remains as to what time of day represents byn ha-arabim when the sacrifice was to be offered and on which day the lamb was to be eaten together with unleavened bread. Today’s Modern-Hybrid groups, consisting mainly of various Sacred Name groups, present a blend of the two systems (System G). For the true seeker of Yahweh’s truth, it is self-evident that there can be only one correct understanding of byn ha-arabim. Our effort now is to examine the evidence from Scriptures which will clearly define the issues relevant to arab (evening) and byn ha-arabim (between the evenings). We shall deal with the term arab first. Our first clue for the timing of ערב (arab) comes with its Hebrew definition. The very meaning of the Hebrew term ערב raises important questions as to its use by the Pharisees and others following System B when they use it to refer to the afternoon, especially beginning at the ninth hour (about 3 P.M.). Rather, based upon the word’s defintion, it seems better suited to a time suggested by the Aristocratic view, i.e., around sunset, or more exactly the period of twilight (between sunset and full dark), when sunlight commingles with darkness. In fact, both sides will agree that at least one of the two arab periods begins or is connected in some way with sunset. To fully discover the meaning of ערב, we shall investigate the use of this term as given in Scriptures. Ad (עד): Exclusive or Inclusive? Our next preliminary definition is the Hebrew term עד (ad; until). As we proceed with our evidence, it will become clear that the term עד (ad), when directed at the word ערב (arab), is often used to denote exclusive dating: that is, when the word arab represents a period of time and is preceded by the word עד (ad; until), arab is all or in part excluded as continuing the event. It is not inclusive, i.e., including all that follows, as the advocates of System B sometimes insist. The expression ועד (u-ad; and until), on the other hand, can be inclusive. For now we need merely recognize that עד carries both an exclusive and inclusive intent, depending upon its context. It is certainly true that, based upon context, עד can mean during an event or time, but it is also just as true, based upon context, that עד can mean just “up to that point” (exclusive). Therefore, we understand the meaning of עד by its context, not by our predisposition. We will also find that both an inclusive and exclusive usage for עד can be found within the same discussion, but again context is the key for defining its meaning. An important example of the timing of arab is found in 1 Samuel 30:17. In this story David, who later became the king of Israel and Judah, staged an attack upon a large army of Amulek who had invaded Palestia and Judah, plundering and destroying the people there. When he found them, the Amulek were spread out over the land, eating, drinking, and feasting. And David struck them מהנשף ועד הערב למחרתם (ma-ha-nesheph u-ad ha-arab la-makharothim; from the nesheph and until the arab for the next day). A nesheph is the breeze which comes up both at dusk and dawn. Later, the Jews expanded the term beyond these limits: “in the one case it begins before sunset, and continues till after sunset; in the other, it begins before sunrise and continues till after sunrise.”21 Nevertheless, in Scriptures nesheph does not appear to go beyond dawn and dusk. Job, for example, speaks of the stars in a time of nesheph, indicating the lateness or earliness of a נשף (nesheph). A clearer understanding of the periods of nesheph and ha-arab as they appear in 1 Samuel 30:17, is made both by Josephus and the LXX. Marcobius, in this regard, informs us that the time called by the Latins vespera “follows” sunset.34 Hesperas, likewise, is the time of the evening twilight, during which one can see the evening star. Josephus, therefore, explains the fighting as having taken place from the first hour of the day, when the Amulek were eating their morning meal, i.e., around sunrise, and until ἑσπέρας (hesperas; twilight). His statement is equivalent to the phrase that contains the Hebrew “from נשף (nesheph) and unto the ערב (arab) of the next day,” nesheph in this case being a reference to the morning breeze. Josephus makes no mention of a new day. The arab mentioned in 1 Samuel 30:17 was the next twilight that followed the morning that the battle began (i.e., from dawn until dark). Supporting this understanding, the LXX paraphrasing of 1 Samuel 30:1737 reads, “from ἑωσφόρου (eosphorou; the morning star) ἕως (eos; until) δείλης (deiles; afternoon, evening) καὶ (kai; even) ἐπαύριον (epaurion; upon the next day). • δείλης (deiles), δείλη (deile), etc., “the late afternoon, evening,”39 is a broad term “divided into early and late (πρωΐα and ὀψία)”; ὀψία referring to “the latter part of the day, evening,”40 and being a form of ὀψέ (opse),41 from ὄπίσω (opiso), “to the back, i.e. aback,” and meaning, “(through the idea of backwardness); (adv.) late in the day; by extens. after the close of the day:—(at even, in the end)”;42 “Adv. after a long time, late.”43 Therefore, δείλης (deiles) includes the time “after” the end of the day. For the LXX, the battle was counted as lasting from the time that David set out on his campaign, before sunrise (dawn), and lasted until the δείλης (deiles), further defined by the term καὶ (even, also). The word καὶ in this context is important, for it informs us that the battle lasted until that part of the δείλης (deiles) which extended into the new day, which in the Hebrew is called ha-arab and by Josephus ἑσπέρας (hesperas; twilight). This distinction was necessary because the period of δείλης straddled both the day the battle began and the next day. If this situation had not been the case then there would have been no reason for the LXX to mention that the δείλης belonged to the next day. It would have been self-evident. Remember, the LXX was written in Greek and the Greek day ended at sunset. The text had to define which part of δείλης was meant. In each case (whether it is the LXX or Targum Jonathan), the term ha-arab is equated with the period that belongs to the next day, at the time called ἑσπέρας (hesperas; twilight) by Josephus and רמשא (ramesha; twilight) by Targum Jonathan. That arab begins a scriptural day and that עד ערב (ad arab; i.e., until arab) is exclusive dating is supported by scriptural examples. That these are exclusive datings of arab is verified in Leviticus 11:32 and 17:15 where added to the phrase עד ערב (until arab) is the statement, “then he shall be clean,” i.e., when arab begins he is clean. Simply put, a man who came into contact with a dead person was unclean for seven days. Since that man was unclean on the seventh day, as we shall shortly see, he could not be considered clean again until the eighth day. The Hebrew prefix ב (be) means, “of time: in, within,”55 i.e., during that time. Therefore, בערב (be-arab) means “within arab (evening).” Accordingly, the seventh day of uncleanness is not over until the time of בערב (be-arab; within arab). Taken together, a man touching a dead person and being ritualistically purified is still unclean until the arrival of the time of arab; and within arab he is once again clean. That a person is only counted as being clean on the eighth day is demonstrated by a parallel law regarding a woman’s seven day period of uncleanness. It is only “after” the seventh day, i.e., on the eighth day, that one becomes clean and able to go to the priest at the tabernacle. This evidence proves that the matters belonging to a day end when arab begins. Daniel, 8:14, for example, counts a series of days as ערב בקר (arab baqar), again beginning each 24-hour period with arab. The evidence both from the definition of the term arab and from David’s war against the Amulek proves that the period of arab (evening) was equated with twilight, which was after sunset, beginning the 24-hour day. Additionally, the evidence from the laws of uncleanness demonstrate that a 24-hour day did, indeed, begin with arab (evening), the time period occurring just after sunset. This wraps up Part I everyone and any doubts about the usage and correct meaning of the terms ערב (arab) and עד (ad), specifically when used together in Scriptures, should be gone . Still lots more ahead so be on the lookout for 34. Passover – Between the Evenings where the the confusion regarding the term byn ha-arabim (between the evenings) will also be discussed and resolved. 1 See 12. Passover – Hasidic Practice I; 13. Passover – Hasidic Practice II. 2 See 14. Passover – Aristocratic Practice I; 15. Passover – Aristocratic Practice II. 3 GHCL, p. DCL-DCLI, DCLII. 4 SEC, Heb. #6148, 6150–6151, 6153. 5 GHCL, pp. 651, 652. 6 HEL (Hebrew-English Lexicon. Zondervan Edition, 1970. ), p. 201. 7 CHAL (A Concise Hebrew and Aramaic Lexicon of the Old Testament. William L. Holladay, 1971. ), p. 282. 8 SEC, Heb. #6158; cf., GHCL, p. DCLII. 9 TBBC (The Broadman Bible Commentary, Volume 1, Clifton J. Allen, Nashville, Broadman Press, 1970. ), 1, p. 123. 14 Gen., 41:50, cf., 41:52-47:11. 15 See CHAL, p. 265. 17 HEL, pp. 137, 147, 64; GHCL, p. CCCCLXXXV, CCXI–CCXII-CCXIII, CCXIV. 21 JE (The Jewish Encyclopedia. Ed. by Isadore Singer. 12 vols. New York, KTAV Publishing House, Inc., 1964. ), 3, p. 501. 22 HEL, p. 131; GHCL, pp. CCCCXXI, CCCCXXII-CCCCXXIII, CCCCXIV-CCCCXXV. 27 GEL (An Intermediate Greek-English Lexicon. Founded upon the seventh ed. of Liddell and Scott’s Greek-English Lexicon. At the Clarendon Press, Oxford, 1961. ), p. 117; GELNT (Greek and English Lexicon of the New Testament, by Edward Robinson, new edition, revised and in Great part rewritten, London, Longman, Brown, Green, and Longmans, Paternoster-Row, 1850. ), p. 106. The Greek term ἄριστον (breakfast) is differentiated from δεῖπον (supper) in Luke 14:12; Jos., Antiq. 8:13:8. 28 See Xenophon, Cyro., 6:4:1. 32 Homer, Od., 22:318; GEL, p. 318. 33 HLD, p. 1980; cf., Pliny, 2:16 §79. 36 Arrian, Anab., 3:4:2. While discussing of the changing temperature of the water from the spring at the Temple of Ammon, Arrian in this passage writes, “For at midday the water is cold to the taste and even more to the touch, as cold as can be, but when the sun sinks towards ἑσπέρας (hesperas) it is warmer, and from ἑσπέρας (hesperas) on it grows warmer and warmer until midnight, and at midnight it is at its warmest; but after midnight it cools off in turn, and from dawn onwards it is already cold, but coldest at midday.” Arrian has divided the day into several parts: after midday the sun sinks towards ἑσπέρας (hesperas), i.e., the afternoon until sunset; then from ἑσπέρας (hesperas) until midnight; followed by from midnight until dawn; and finally from dawn until midday. This statement clearly defines ἑσπέρας (hesperas) as the time immediately following sunset. 37 LXX 1 Samuel 30:17. 42 SEC, Gk. #3694, 3796. 45 SEC, Gk. #1887; GELNT, p,. 283. 46 SEC, Gk. #1909, 839. 47 DJPA (A Dictionary of Jewish Palestinian Aramaic of the Byzantine Period, by Michael Sokoloff, Ramt Gan: Bar Ilan University PRess, 1990), p. 526; The Aramaic phrase, “ברמשייא ובקריצתא ובטהרייא; (be-rameshaiia u-be-qaritsatha u-be-tahriia; in the evenings, at daybreaks, and in the afternoons),” reveals the order of time during a 24-hour day (Vayyikra Rabba [Ms. Vat. Ebr. 32], 554:2). 49 See Lev. 11:24-25, 27-28, 31-32, 39-40, 14:46, 15:5-8, 10-11, 16-19, 21-23, 27, 17:15; Num. 19:7-8, 10, 21-22. 50 Num. 19:1-10. The ashes mixed with water creates a lye soap. 54 HEL, p. 30; GHCL, pp. XCVI–C. 59 The Greek word μετὰ (meta) means, “of Time, after, next to” (GEL, p. 501). 61 EQ (The Evangelical Quarterly, vol. 43.4, Oct.-Dec., 1971. The Day, its divisions and its Limits, in Biblical Thought, by Roger T. Beckwith), pp. 223-224. 62 The Hebrew term בקר (baqar): “to plough, or (gen.) break forth,” “dawn (as the break of day); gen. morning” (SEC, Heb. #1239, 1242). In Scriptures baqar always comes just before sunrise. 63 Gen., 1:5. For “יום אחר (yom akhar)” meaning “one day,” rather than “day one,” as sometimes translated, see its appropriate use in 1 Sam. 9:15. 64 Gen. 1:8, 1:13, 1:19, 1:23, 1:31. 66 See above notes 30-35. For a complete definition of the Greek term ἑσπέρας (hesperas) also see FSDY, 1, pp. 215f, n. 36. This entry was posted on 05/27/2013, 7:54 am and is filed under Calendar, Passover, Religion, Unleavened Bread. You can follow any responses to this entry through RSS 2.0. You can leave a response, or trackback from your own site.